Who doesn’t look forward to having an ice cream leisurely while experiencing the comfort provided by a sit-down ice cream parlour? 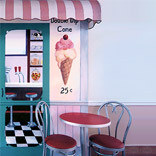 As a kid we used to go to these sit-down parlours and enjoy the limited flavours of ice cream. As we grew up, though we had a variety on our platter but our liking for sit-down parlours faded and we started relishing the experience of take-aways. However, with the entry of potential players like Hagen Dazs and Swensen’s among many others, the concept of sit-down ice-cream parlours is again catching on. Rentals are an issue at very popular destinations and it involves the making of the business plan to work around those rental challenges. Traditionally, it has been experienced that ice cream sales come down during extreme winters, but data has explicitly shown that this differential in sales has narrowed over the years. Providing a value added menu enhances a parlour’s sales and gives an added advantage too, generating more footfalls than what usually are experienced otherwise. Looking at the wide variety of target audience, it becomes all the more sensible to offer the same. Joshi opines, “Primary target audience is that of teenagers and young adult who enjoy ice cream with friends / colleagues and secondary is of the older people, who always enjoy having ice cream with their family.” “We do offer beverages, both hot and cold along with ice-cream shakes and floats. They form about 15-20 per cent of the menu mix especially the shakes,” he further adds.